"KNOB-T10/B11-125-BLK-L Black tapered collet knob with white line, 10mm top, 11mm bottom, 1/8"" shaft size"
Black tapered collet knob with white line, 10mm top, 11mm bottom, 1/8"" shaft size. Used by many manufacturers of pro audio gear, good for DIY projects. The knob is fastened by using a spanner tool or small needle nose to tighten the small nut near the top of the knob. Use any 9 mm collet cap with this knob. This item is not returnable. Note: this knob cannot be used to replace the upper part of a dbx dual concentric knob. For this part please use the 11 mm collet knob with 4mm shaft size, listed elsewhere on our web store. Please note: dbx used different knob sizes on separate production runs of some products. Before ordering, please measure the dimensions of your old knob to verify that this is the correct size. This item is not returnable. 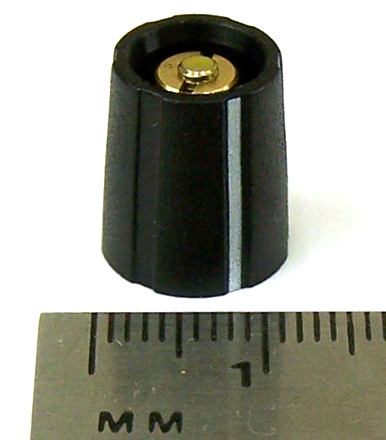 Customers often come to us seeking replacement collet knobs and knob caps for dbx equipment. We stock virtually all these parts, but many types are very similar and selecting the right items can be tricky. Here are some guidelines that we hope will help. Knobs and knob caps for dbx controls are all modular, and are sold separately. The knobs and caps are available in many different colors and size combinations. The colors are easy but you need to check the sizing carefully, especially when selecting knobs, because some types are very similar. For dbx gear all of these knobs are black with a white line. To replace or select a dbx knob, carefully measure the top and bottom diameter of a sample knob — it will be the T10 or T14 type. Then, check the shaft diameter. The 1/8” and 4mm sizes are very similar, but the 4mm type is slightly bigger. Knowing these three dimensions will allow you to select the right knob. Once you’ve chosen the right knob, choosing the cap is easy. The T10 knobs all use 9mm caps, with a line. The T14 knobs all use 13mm caps, with a line. The cap will be a 9mm type, with line. Please be careful when ordering these knobs, as we do not accept returns on them.